As we approach the Lenten Season I'd like to look both forward and backward in our Liturgical Calendar. 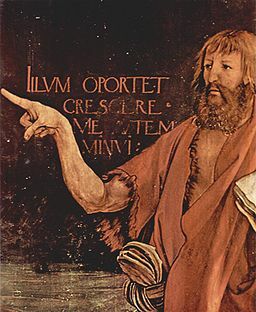 Several of our Sunday Mass readings, both in Advent and in the New Year featured John the Baptist (pictured above). What made him so special was his single-minded devotion to Christ and doing His will. John the Baptist pulled no punches in rebuking those engaging in sinful behavior, much like Jesus Himself! With his baptism of repentance, John clearly exhorted people to give up their sinful ways, much as we are especially encouraged to do during Lent. While John the Baptist preached and baptized for repentance, he kept his focus on his service to Jesus (and thus on ours as well)! He compared himself to a bridegroom's best man who rejoiced in his presence (John 3:29). He sought, echoing the prophet Isaiah (Is 40:3), to make way for the Lord to travel down a smooth uncluttered path. A lesser figure might have quite easily sought to proclaim himself as the Messiah, the One to Watch, the One to Follow, as it were, but not John! He says of our Lord at one point in the Gospels that “He must increase but I must decrease” (John 3:30). In Lent we must decrease, in the sense that we must use this time as a valuable opportunity to get rid of our own clutter, including all those sinful attachments that keep us away from Jesus. He must become front and center in our lives. This is a tall order to be sure, but one that is well worth the effort. I strive to have the Christ self in me take over when the Chris self is bungling things, as so often happens! The good news is that Christ is more than ready to help us clean out our closets or otherwise tidy up our souls disheveled (or worse) by sin. Sure you may fall and fail, perhaps many times, but get back up again each time and, above all do not despair. Christ can do wonders with our weaknesses if we let him work within us. He must increase. We must decrease. By that I mean that the shallow, petty, selfish, hedonistic part of our natures must decrease. This comes from Original Sin, our unsavory inheritance from our first parents, Adam and Eve. Some of you might have seen cable TV shows like “Hoarders”, in which people are compelled to remove rubbish and possessions piled high from their homes that are making living conditions unbearable and unsanitary in numerous instances. Our sins are like that. Sometimes we grow so attached to particular sins, such as alcoholism, gluttony, grudges or hatred, that, even though they might make us miserable we can’t see letting go of them! In these instances, God becomes the last thing on our minds, if He’s thought of at all! Jesus spoke in the Last Supper discourse of making a home in souls in this touching manner: “If anyone love me, he will keep my word, and my Father will love him, and we will come to him, and will make our abode with him” (John 14:23). He spoke in a similar manner in the book of Revelation: “Behold, I stand at the gate, and knock. If any man shall hear my voice, and open to me the door, I will come in to him, and will sup with him, and he with me” (Rev. 3:20). In the case of souls steeped in sin, there may be little or no room for our Lord to stand in their “abodes”, much less to sit down for a meal! One great way to “clean house” and make room for Jesus this Lenten season, and any other time for that matter, is to go to confession after examining your conscience for venial and moral sins. Also, make Lent a special time for you not to just “give up” something that gives you pleasure (like that perennial favorite, chocolate) but something that gives you pain as well. You can try that for just a day or two at a time if that will help you get started. And above all, give up any desire you might have to be unkind to your fellow sinners; or to “go it alone” in trying to achieve salvation without asking for God’s help, guidance, and grace. You weren’t meant to. One other important thing to “give up” this Lent is any reluctance you might have to go to confession, or to pray. Prayer can work wonders in helping you draw closer to our Lord. Even if it’s just an Our Father and a Hail Mary at the start and end of the day for your intentions. Our Lenten Prayers section has some other good prayers for you this season. And, of course, don’t be afraid to speak to God in your own words spontaneously. This is a great time of year to let Him help you be the person He meant you to be! Think also about those opportunities you might be missing to help others as well.